Tooth sensitivity is not uncommon and most people would have experienced it at some point of their lives. But usually our saliva, which by nature is filled with minerals; act as a protective mechanism by sealing the area of exposed dentine. This is done through laying down of mineral deposits over a period of time, which explains the reason behind sensitive tooth needing a couple of days before it settles down. Professional scale clean can inevitably remove this soft layer, allowing dentine to be exposed again, resulting to tooth sensitivity. But this does not usually cause a problem as normal saliva will recreate the seal in a matter of days, sometimes hours. Poor quality saliva on the other hand, may not contain adequate minerals to achieve this effect, allowing tooth sensitivity to manifest for longer periods of time. This is where some form of intervention may be required to help manage extreme tooth sensitivity. There is a range of tooth sensitivity treatment available to public in order to help alleviate the pain experienced. Most often the cause will need to be determine and investigated as there can be significant differences in terms of management. 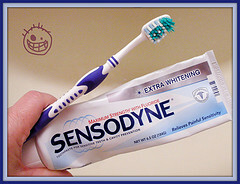 Over the count products such as Sensodyne toothpaste is usually recommended to patients with sensitive teeth. Sensodyne contains potassium nitrate as the active ingredient which is known to help reduce tooth sensitivity. It works by allowing potassium ions to flood through dentinal channels that connect to the nerve endings. This surge of potassium ions disrupts signal transmissions of nerve, therefore effectively blocking out pain. Sensodyne toothpaste also contains sodium fluoride where fluoride ions can result in mineral deposits along the dentinal channels, causing gradual thickening of the channels. This reduces the space available for dentinal fluid, thereby reducing the amount available for stimulus to act on. This prevents changes in fluid movement and in turn leads to less pressure on nerve cells and stops tooth sensitivity mechanism. Conventional toothpastes such as Colgate which contain sodium fluoride as the active ingredient essentially do the same thing, just without the effects of potassium nitrate. It can be less effective for more severe cases, but in some individuals it often does more than is required. Although the usage of such toothpastes does help manage tooth sensitivity, they only acts as a short term treatment and require consistent usage for it to work effectively. Its results often diminish after cease of usage, leading to relapse of tooth sensitivity. Professional products such as Duraphat which contains high concentrations of fluoride can be applied by your dentist on sensitive areas. 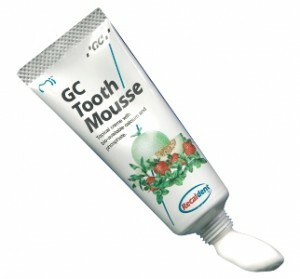 Another product which can be obtained from your dentist is Recaldent Tooth Mousse which is derived from milk. Tooth mousse comes in a variety of flavours and is safe to use in everyone, except for those with milk allergies. It works effectively in sealing off exposed dentinal tubules permanently after continuous usage. Another quick resolution is to place a layer of adhesive material on the sensitive areas. Dentist commonly do that to help manage tooth sensitivity but the main problem being these do not last very long especially with inappropriate toothbrushing, and hence may require replacements. That being said, as mentioned, sensitive tooth treatment is largely based on its cause. While most such as tooth sensitivity to hot and cold can be treated with the steps outlined above, some requires totally different approach. For example, tooth filling sensitivity which is common problem with poorly placed tooth coloured fillings will need to be replaced entirely to manage the sensitivity. Delaying this can lead to other problems such as food accumulation in the gap between tooth filling and tooth and dental decay. Tooth sensitivity to sweet is often a sign of decay rather than normal tooth sensitivity and needs to be managed accordingly. What can I do myself to minimise sensitive tooth? There are a few home remedies and tips which can help manage tooth sensitivity without burning a hole in your wallet. Prevention is obviously the key but we can’t all avoid acidic food such as oranges and soft drinks. Good maintenance of oral health often helps as it ensures our saliva contains adequate protective mechanism and keeps our fillings at tip top condition. Your normal fluoridated toothpaste at home goes a long way in helping minimise tooth sensitivity as mentioned before. If toothbrushing alone is inadequate, try smearing a small layer of toothpaste on the sensitive areas of your tooth with the tips of your fingers or cottonbud before bed. This will keep a concentrated amount of flouride on your tooth surface, enhancing the ability to seal off the dentine exposure. But note that this is inappropriate for children under the age of 6.